Adam Styka (1890-1959) a member of a distinguished family of Polish painters, created the oil canvas of the execution, a copy of which is reproduced here. This painting, which dates from the spring of 1948, was transferred to Rome, to the headquarters of the Sisters of the Holy Family of Nazareth in 1965. A copy of it can be found in the provincial house of the Sisters in Philadelphia, Pennsylvania. "O God, if sacrifice of life is needed, accept it from us who are free from family obligations. Spare those who have wives and children." Without warning or provocation, on July 31, 1943, eleven of the twelve Sisters were imprisoned. The Sisters were loaded into a van and driven beyond the town limits. 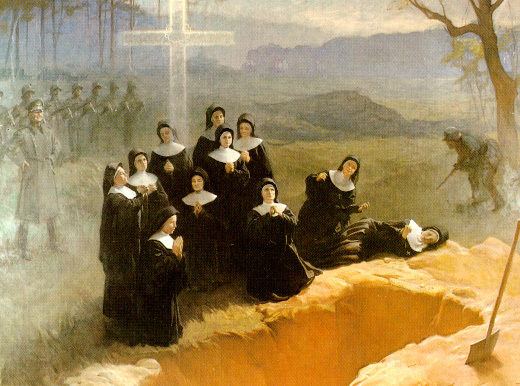 On August 1, 1943 the Sisters were shot and buried in a common grave at Nowogrodek, then on the eastern borders of Poland but now in Belarus where their beatification of these nuns will encourage the "reborn" Catholic Church. The painting is the work of Adam Styka (1890-1959), a member of a distinguished family of Polish painters. 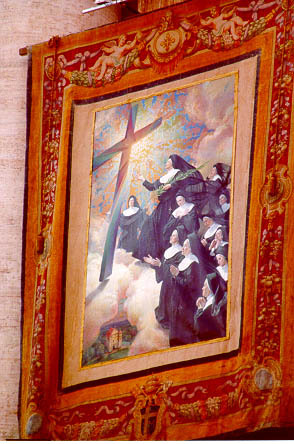 The painting on oil canvass, which dates from the spring of 1948, was transferred to Rome to the headquarters of the Sisters of the Holy Family of Nazareth in 1965. A copy of it can be found in the Provincial House of the Sisters in Philadelphia. After the Sisters' execution many of the most recently arrested men were not killed. Some were released or sent to Germany for work. The life of the Sisters' chaplain, Father Aleksander Zienkiewicz, was also spared during this time. Zienkiewicz later wrote a work in Polish which was translated as No Greater Love (Pulaski, WI: Franciscan Publishers,1968). Two of the Sisters of the Holy Family of Nazareth, M. Teresa Gorska and M. Noela Wojtatowicz have published, Blessed Martyrs of Nowogrodek (Chicago: Congregation of the Sisters of the Holy Family of Nazareth, 2000), which gives the whole story of the martyred sisters, heroines of the holocaust in what was Poland, with their individual pictures and with a collection of poetry to honor them. On September 18, 1991 the canonization process for the eleven sisters was officially opened and, on June 28, 1999, the Zenit News Agency announced that Pope John Paul II had proclaimed that they were martyrs. 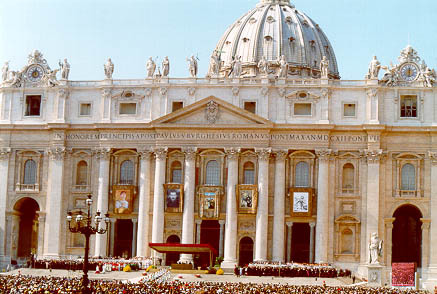 The same pope beatified them on with a group of thirty-three others on Sunday, March 5, 2000. That ceremony is portrayed in these pictures taken by Siobhan O'Neil who witnessed the beatification..
Beatification ceremony in St. Peter's Square of the eleven nuns by Pope John II. These images taken from the personal collection of the Rev. Vincent A. Lapomarda, S.J. Last updated February 22, 2000 Copyright © 1997-2000, College of the Holy Cross.